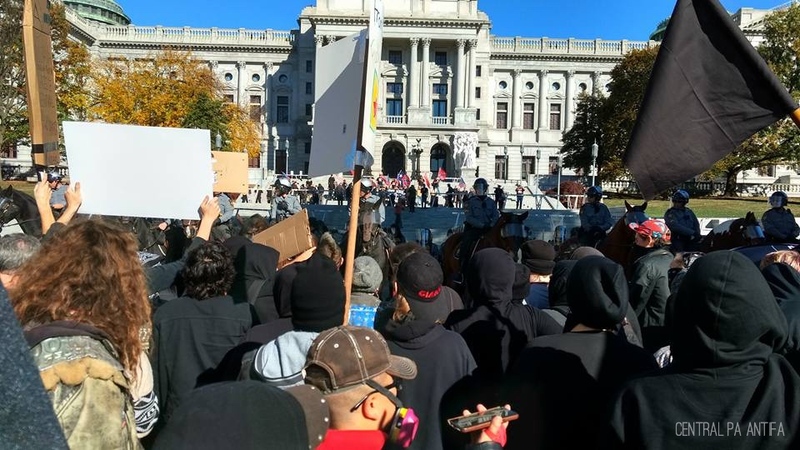 When the NSM (National Socialist Movement) chose to hold their bi-annual “Anti-Diversity” rally, they claimed their choice of Harrisburg, Pennsylvania was just the “luck of the draw.” An ironic statement, since it turned out the day wasn’t so lucky for them after all. Details of the NSM’s plans were also trickling in. Word was quickly heard that Matthew Heimbach, a familiar face in Pennsylvania, would be in attendance to give a speech announcing that the recently-formed Aryan Nationalist Alliance was already being renamed the Nationalist Front. The November 5th event had been taken over by the Traditionalist Worker’s Party and the KKK, and it would be their new group’s coming-out party. Security would be provided by Keystone United (FKA Keystone State Skinheads), who can’t seem to shake their reputation as nothing more than street thugs. This news only resulted in greater interest by the anti-fascist/anti-racist community, and groups from Georgia to New York and everywhere in between contacted Central Pennsylvania to coordinate plans. The fascists’ bad luck persisted up to the day of the rally. Anti-fascists had already planned to arrive at the foot of the Capitol steps an hour before the NSM rally at 2 pm. However, it was assumed that fascists could be on time. Their PA system and mic were apparently incompatible, and 45 minutes went by while two of them fiddled with it amid constant harassment from protesters. When the remainder finally did show, their pathetically small group had to be escorted through the building itself by a cadre of riot police. A crowd of 200 or more protesters greeted them with jeers and profanity. The police themselves outnumbered the fascists in attendance. 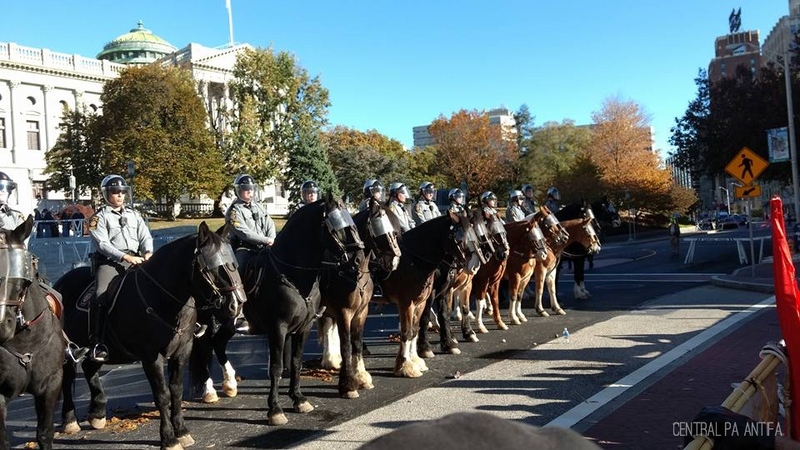 Police on horseback as well as several columns of riot police assembled throughout multiple rows of barricades. Spotters roamed the roof of the building, and a helicopter circled overhead. In addition, a police drone was flown in over protesters’ heads multiple times. 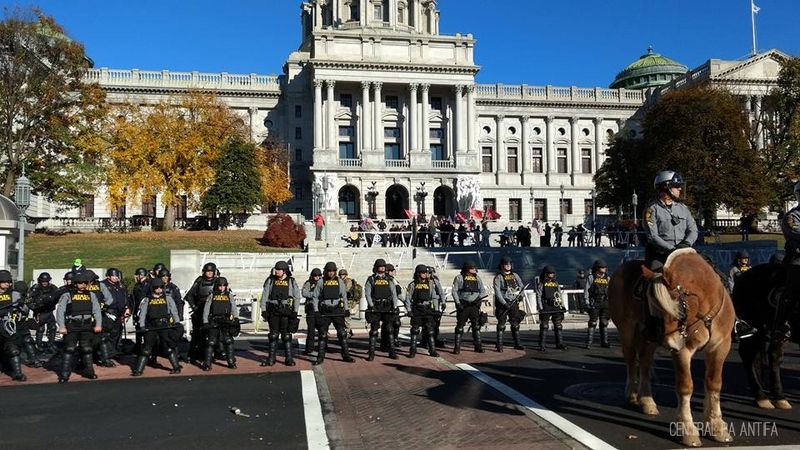 As the protesters gathered steam, it was noticed that Keystone United goons were loitering in alleys behind the bulk of the protesters, taking pictures and trying to look inconspicuous. Other fascists were spotted intermingled in the crowds, some of whom were dressed similar to antifa in an attempt to blend in. These infiltrators were chased off, and several scuffles occurred on the outskirts. Police were also agitated by bottle rockets being fired and rotten food being thrown by the crowd. In the center of the protest, at the front, people began to dismantle the barricade in their excitement. One barricade finally came down, but police swiftly moved in and snatched a comrade at the front of the ranks. Another was snatched in a coordinated move during which police fired pepper spray to quell protesters. A third was taken in a skirmish with an invading fascist, although the fascist in question was not arrested or removed. He was instead taken to sit in the back of a cop car for a short time, then let out again to come back and cause more trouble. In the background, the NSM, Heimbach, and the KKK took turns droning on and sieg-heiling themselves. Although it was assumed they could hear their own speeches, barely a word made it down to the street over the noise of the chants, drumming, and profanities. Afterwards, it was discovered that even the NSM’s audio recording of the event was unusable due to the protester’s din in the background. The media also focused entirely on the protest, so the NSM’s message went unheard by anyone. Overall, this was a highly successful event. The support and presence of so many were invaluable in making this a victory. Lots of intel was gathered and the nazis’ platform was effectively taken away. The energy seen on November 5th was encouraging, as there are many fights still ahead of us. The alliances made, networking opportunities discovered, and friendships solidified will carry us through in the uncertain times ahead. Harrisburg was witness to the fact that, just as fascist and racist rhetoric has increased in this country, so has the anti-fascist and anti-racist response, and our numbers, our energy, and our momentum are far greater than theirs as long as comrades continue to fight. This story was re-published on Love and Rage with the expressed permission of Central PA Antifa.